With respect to having an insight into what the ERP experience was, some questions were asked and the answers of the respondents were documented as follows. Was your recent ERP project completed on time? 71% said yes while 29% said no. With respect to your recent ERP project, what is your greatest challenge? 31% said it was a lack of qualified personnel, 30% admitted to business and IT alignment, while 19% admitted to low system performance as compared to original expectations. 7% said it was budget overruns, timeliness was a challenge for 7% while 6% of the sampled population admitted to lack of quality end user training. 61.1% of ERP implementations take longer than expected. Was your most recent ERP project completed? 41% said the project was on the budget, 35% said it was over the budget while 24% said it was under the budget. 1 out of every 10 software dollars is spent on ERP. 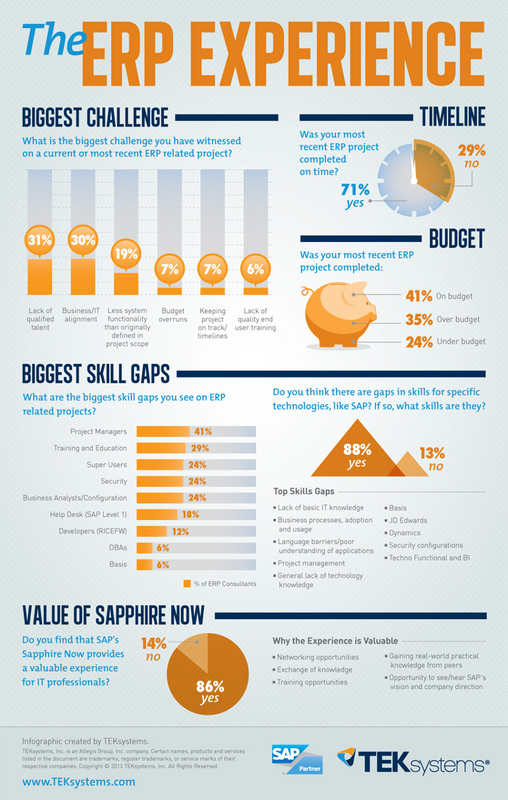 What are the biggest skill gaps seen on ERP related projects? These were the responses. 41% of ERP consultants saw project management as a gap, 29% felt it was education and training, 24% felt it was super users while 24% felt it was security. 24% felt it was business analysis and configuration, 18% felt it was help desk support while 12% felt it was developers. 6% felt it was DBs while 6% felt it was basis. Do you think there are gaps in skill for specific technologies like SAP? If so, what skills are they? Of the sampled population, 88% said yes while 13% said no. 1. Poor basic IT skills. 2. Adoption of business process and language. 3. Inadequate understanding of applications and language barriers. 5. Lack of technological knowledge. Do you find that SAP’s Sapphire now provides a valuable experience for IT professionals? 14% of the sampled population said no while 86% said yes. As to why the experience is valuable, the following responses were provided. 1. It provides an opportunity for networking. 2. It provides a platform for the exchange of knowledge. 4. It allows for the gaining of practice experience from peers. 5. It provides the opportunity to see and hear SAPs vision and company’s direction.